Life has been full, full, full here. Saturday Tom graduated with his M. DIV. I can't even begin to tell you how very, very proud I am of him. He accomplished this while working full-time as a sergeant in our local (largish city) police department, and faithfully training and mentoring his dozen children. (He graduated with honors too!) We, as a family, reap the fruit of his labors. I can't even begin to tell you how very rich our family devotion times are as he opens God's Word and instructs and leads us in worship. Here's a little glimpse of my today. 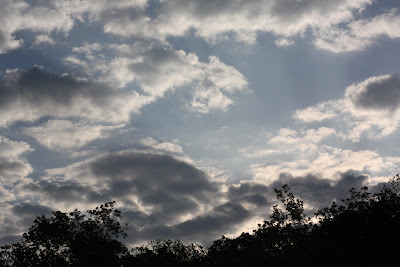 The view out my east-facing window this morning as I had my quiet time with the Lord. How could I help but be inspired? 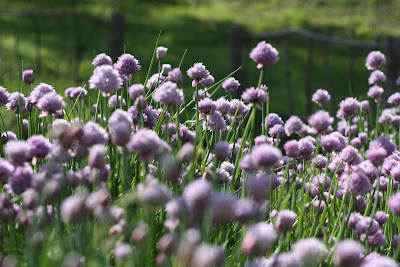 Chives blooming with great abandon in my herb garden. Rain was forecasted for this afternoon, so the children and I worked quite hard to repair my herb garden and get it ready for some new plants. The girls and I are also excited to be putting in a new garden which will be entirely flowers! Ok, the veggies are good~ I love having the fresh organic produce, but I *really* love having the herbs and flowers! Not very practical (I suppose the herbs are sort of practical), but so, so pretty. It is our desire to have such a great abundance of flowers to cut this summer that we can have fresh flowers in every room, with lots to share as well! So the boys were helping haul compost from our goats and chickens and run the you-gotta-have-man-muscles-to-run-it tiller for me. If you don't have big boys at your house, you're *really* missing out! They also hauled rocks to border my garden beds~ we have a super-good crop of rocks 'round here. Love using what I have.... I've got rocks, so I'll use rocks! Our day, some glimpses of my life, condensed into one blog post. I feel very, very blessed. Congratulations on your husbands great accomplishment! You too! He could not have done that without you. 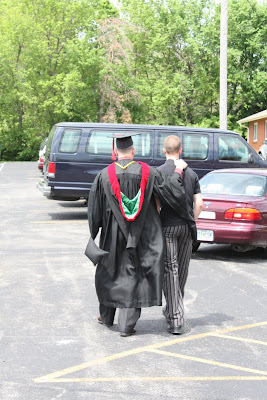 My husband got his MDiv before we were married and it was hard then. I can't imagine doing it with a job and a family. Well done to all of you! you have an herb garden? I am so jealous! Congradulations to hubby, you, children as I know it's a family together-ness to get there!,along w/ God! God bless you as you serve! Susan, Congratulations to your husband & you on the MDiv! What a blessing that he is done with that! Any thoughts of pastoring a church somewhere?